Rumpus Room on 1030 N. Water Street is easily one of our favorite spots in Milwaukee. We go there for dinner more than any other restaurant, we go after working on the weekends because they have awesome late night snacks (I’ll take some popcorn, please). This was our first go for a Bloody Mary. I was really curious to try it out and see how it held up with their other awesome options! We always recommend Rumpus Room to out-of-towners as it’s got a “Wisconsin vibe” with the Bartolotta class. They are just… are the best. Mix: This mix was 100% homemade. I was able to watch the bartender craft it from V8, some unknown juices (she squeezed 3 kinds in), Tabasco, worcestershire, celery salt and pepper. It was stirred, not shaken. I don’t know if this recipe was the bartenders own or if Rumpus Room has a set standard. The bartender certainly knew what she was doing though. The mix was so good. It was classically tasty. It had great consistency and it was perfectly flavored. One of my favorites to date! Chaser: No chaser was served and we didn’t ask for one. Buzz: I did catch a little buzz at Rumpus Room but it quickly faded. Cost: $9.00. For a homemade drink, I thought this was average and reasonable. Of course, I’ll be back to Rumpus Room. I’ll even get another Bloody Mary to see if the recipe is the same. In the meantime, this will be going up on our favorites board. 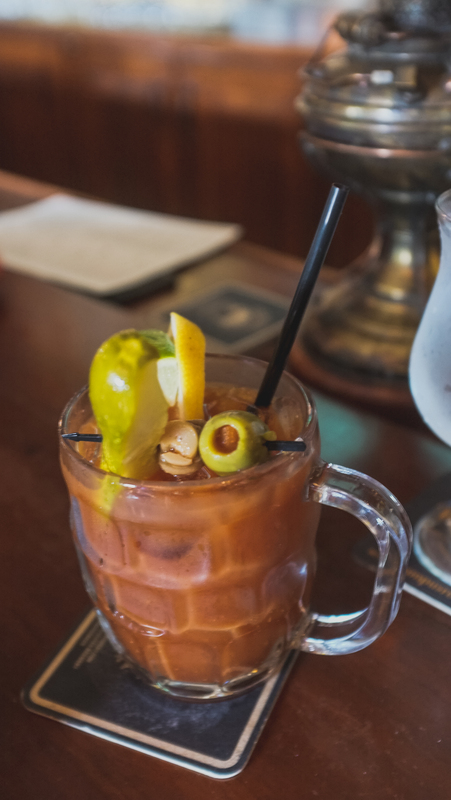 This entry was posted on September 7, 2015 by Shannon in Bloody Marys in the area and tagged Bartolotta, best bloody mary, homemade mix, Milwaukee, Milwaukee Bloody Mary, Rumpus Room.